When we fish, we join the ocean world as predators. That is what we are, by nature, and have been since early times. But unlike other predators, we are limited only by the limits we set for ourselves. Or so we’d like to think. We are subject to all the same natural laws as other predators, yet we behave as if we were not – as though we could fish without regard for fishing’s impact on the ecosystems we share. All creatures share an evolutionary drive to selfishly advance their own species. But in our case, a narrow view of “sustainable” fishing, a lack of regard for sustaining other forms of life in the sea, and “a power over the natural world we can no longer afford to use” all work to our collective disadvantage, irreparably harming the environment that supports all of us. What I call the Berkeley Criterion suggests a more balanced, more natural and far wiser approach to managing marine fisheries, grounded in policies that sustain fishing in a way that protects the broader ecosystem and its living communities. 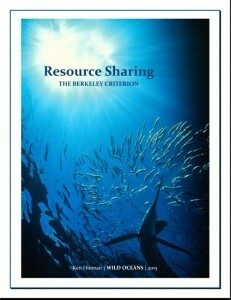 It is, quite simply, Resource Sharing – a novel concept that is nevertheless essential to our co-existence with wild oceans. The future of fishing, I believe, lies in the balance. This paper is dedicated to the memory and vision of my friend and colleague Steven A. Berkeley (1947-2007), who coined the concept of ‘resource sharing’ in long-ago discussions that eventually evolved into this paper.